Where Do Kalamata Olives Come From? How Many Calories Are In Kalamata Olives? Kalamata Olives – Yum, if I say so myself! There are so many different kinds of olives out there. They are some of the best and most exquisite delicacies around, and what’s more – they come in so many varieties! I was a late bloomer when it comes to olives. I never liked them as a kid, and I discovered them later in life. But, in my defence, I have been a big fan ever since. 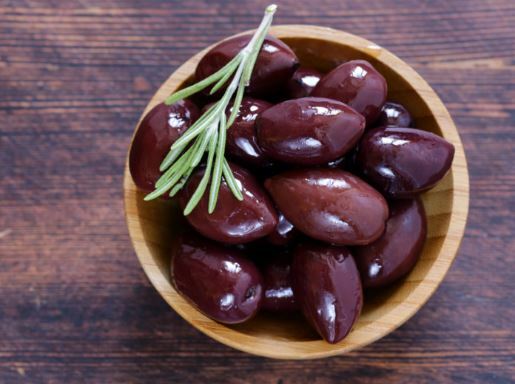 One of the most iconic olives are the Kalamata olives. In some locations, they are better known as “Greek olives” even though Greece has several types of olives which it manufactures, and which easily could claim that title. But, for now, let’s stick to Kalamata. Kalamata olives are a dark purple strain of olives, and they are the products of the olive tree, Olea europaea. 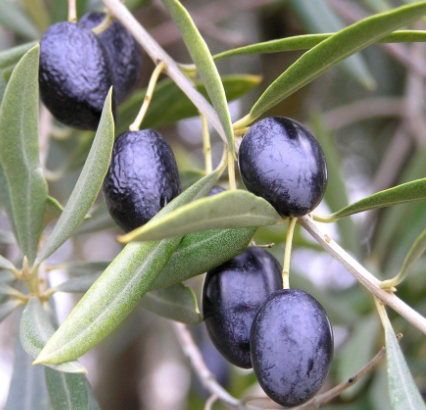 They are larger than ‘normal’ green or black European olives and are grown in the region of Kalamata in Greece. Incidentally, in 2004 the EU issued an order stating that only those specific olives may bear that name, effectively giving Kalamata protected designation of origin (POD) status. Kalamata olives which are grown outside of the said region are sold in Europe as Kalamon olives. Part of the special thing about these olives is that they must be picked by hand. This is done in order to avoid bruising them, and I can totally understand why that is. They are smooth and chunky, and are simply gorgeous to look on and consume! The olive tree which carries Kalamata can be distinguished from the ordinary olive tree by the size of its leaves, which is roughly twice the size of the classic European olive tree. Kalamata olives are high in sodium, which may deter some individuals who are already getting too much sodium in their diet. But, to counter that, I will add that Kalamata olives are a good source of iron, fibre, vitamins A, C, E, and K, and calcium. They are also considered a rather helpful fruit, thanks to their antioxidant content. Antioxidants are vital for proper cellular development. Oxygen is great, but too much of it could disrupt your system and let free radicals roam about your body. Kalamata olives are also known for their high-fat content, but in this case, it is a good kind of fat. This is not to say that you still need to monitor your consumption, but it does put some of the debate to rest. After all, all food can be potentially harmful if you overindulge, right? Kalamata olives are good for your health, and – if you are a fan of olives – you will probably agree that they are mighty tasty. However, if you are attempting to lose weight, you may want to watch your consumption. These olives possess a relatively high-calorie count, and eating too many of them could impede your weight loss aspirations. 100 grams of green olives are about 115 calories. 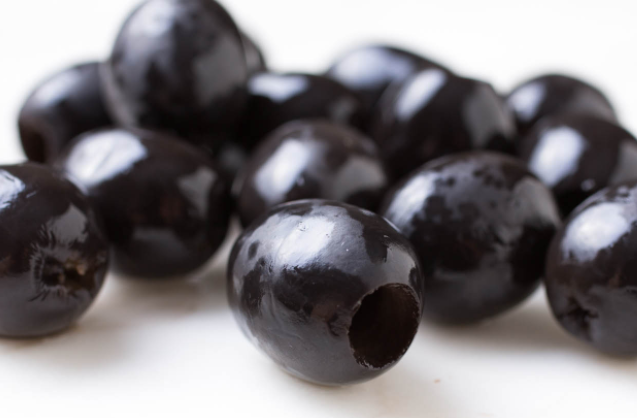 100 grams of Kalamata olives are about 233 calories. As you can see, the difference is significant. If you’re like me, you like to open up a can of olives during supper, and just much away. But if you want to do that with Kalamata olives, you better watch it. These things are tasty, and before you know it, BANG – you’ve eaten past your recommended caloric intake. 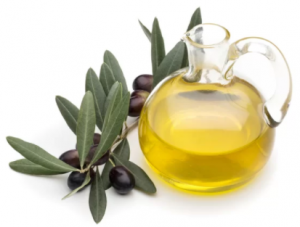 Olive oil is rightfully considered one of the healthiest and most beneficial foods ever to be produced. It formed an ancient bond with Mankind thousands of years ago, and that bond continues to hold up to this day. 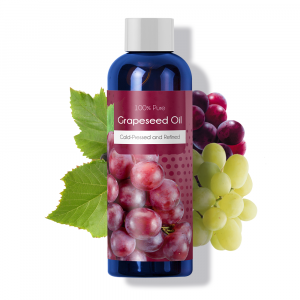 Kalamata oil, in particular, has the ability to retain its flavour for a long time if it is kept in optimal conditions. Obviously, like any oil, it possesses the ability to turn rancid, so keep tabs on your oil supply. 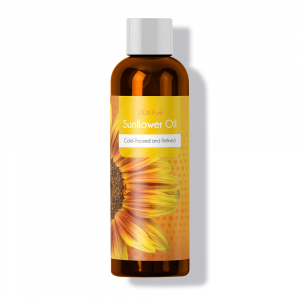 Heat and light are the enemies of natural oils, so it is best kept in a dark glass bottle, and stored in a cool, dry location. 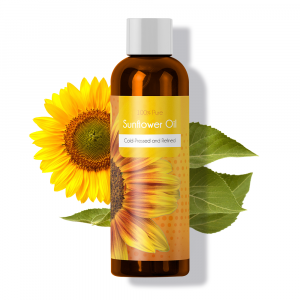 As for the flavour, it is one of the things which seriously distinguish this brand of oil from other olive oils. It has a full body, and a fruity, nutty taste. A good oil is like a good wine, and this is certainly true to this particular brand of olive oil. It has low acidity, and it hits your palate with a snappy, peppery feel. 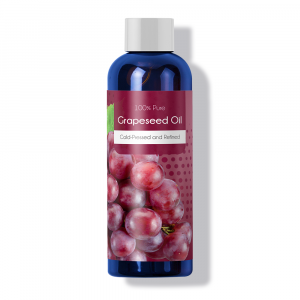 It is for these reasons that it is considered one of the best table oils around. 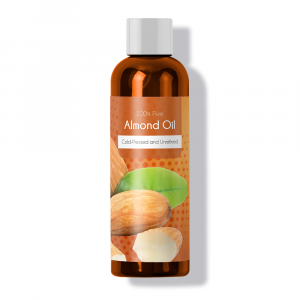 Whether it is for cooking, marinating, or dressing – this oil has got you covered. 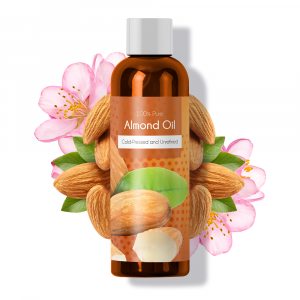 No matter the dish, Kalamata oil is your friend. As a general rule, unpitted olives are better than pitted ones. Learn that now, and graduate. Kalamata olives are known for their unique almond-like shape. When you remove the pit, you basically don’t leave the olive a firm base, effectively rendering it far less attractive, and far less valuable. The pitted olives become a mere shell of their former selves, and this robs them of their noble status. Now, with some olives, this may make no difference, but this is certainly not the case with high-quality Kalamata olives. The pit of the Kalamata is all-important. While it may be considered a pain in the neck to remove the pits during the actual dining is taking place, it is far worse to bite into a flacid, squished, quasi-olive. It is perfectly acceptable to serve whole olives since this shows respect for the olive and its true flavour. In his book My Life as an Experiment, writer and journalist A.J. Jacobs recounts the year where he was a human guinea pig, undergoing various experiments in conduct and behaviour, in month-long increments. I went through a similar thing with Kalamata olives, among other things. I decided to eat Kalamata olives for a month, instead of green olives. A substitute which seems almost negligible, since both are olives, but it was a great change for me. Was it more expensive? Could be, but I also learned a lot from it. I was in good shape to begin with. It wasn’t as if I had some cholesterol or cardiovascular issues (thankfully! ), but I suppose that my blood could use a boost of healthy monounsaturated fats. Basically, eating Kalamata olives for a month made me more vital. I think that is what I noticed more than anything, and what others noticed about me as well. I chose to do conduct this experiment during the winter months, and now I wish I had kept a journal. I mean, the changes to me, personally, were not as dramatic as to necessitate broadcasting and blogging about them, but they were important enough to mention in passing, in this article. If you have the ability to do that, go for it. Your mileage may vary, but substituting green olives for Kalamata ones for a month is not a bad idea! ● 2 pounds uncured Kalamata olives, preferably from a local orchard/market. ● Lots of fresh, clean water (tap or filtered). ● 2 quarts white cider vinegar or wine vinegar. ● 1 tablespoon dried oregano. ● 4 dried red chillies. 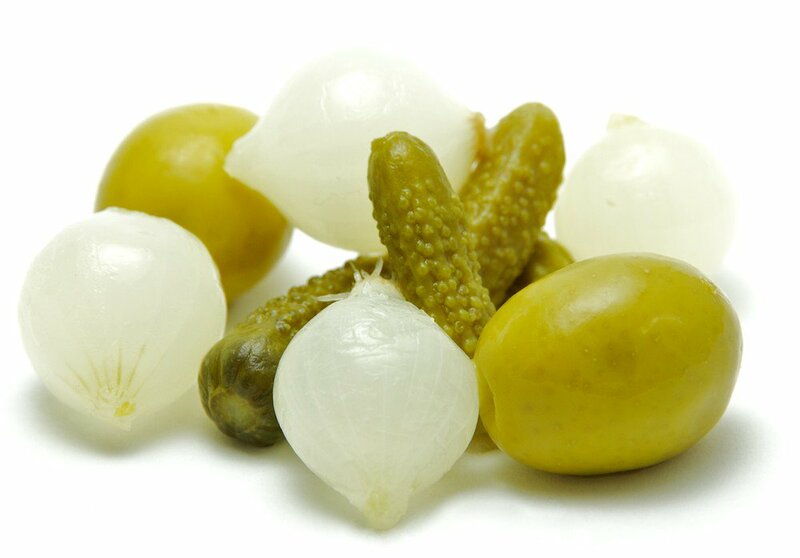 ● 4 cloves chopped garlic. ● 1 cup extra virgin olive oil. Wash and sort the olives, discarding any wrinkled, pitted or bruised ones and picking off the leaves and stems. With a very sharp paring knife, make a fine slit down opposite sides of each olive. This will allow the bitter juices to escape during soaking. In a clean 2-gallon jar or basin, immerse the olives in cold water with a handful of salt. Cover and allow the olives to soak for seven days, replacing the salted water at least once a day — more often if you have the time and opportunity. After five days, fish out one of the olives to see if the bitterness has subsided, just to check if things are going according to plan. At the end of a full week, you should have created non-bitter olives. If not, soak them for another day or two. At the end of the soaking period, drain the olives and wash them in cold water. Spoon the olives into four sterilized mason jars with new lids. In an extra-large measuring cup or a bowl with a pouring spout, mix 4 cups of water — filtered or bottled would be best for this part — with 3 tablespoons of salt. When the salt has dissolved, place a raw egg in the water. If more than a dime-sized portion of the egg surfaces as it floats in the water, you need more salt. Add the vinegar. Use a quality vinegar but remember that you want the taste of the Kalamatas to be prominent. Using a strong vinegar such as balsamic will impart a different character to your olives. Stick one chilli pepper into each jar of olives along with equal portions of the oregano and garlic. Stir the water and vinegar and fill each jar with the mixture, leaving 1/2 inch of space at the top. Close the jars and shake the contents. Remove the lids and finish each jar with a layer of olive oil, about 1/4 cup for each container. Seal the lids tightly and store the jars in a dark place for a month — although it will seem like an eternity. 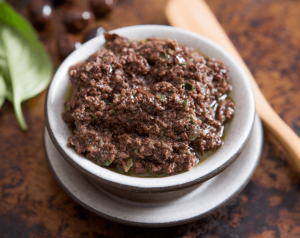 Making an olive spread, also known as tapenade, is a wonderful way to get creative with Kalamata, as well as other types of olives, vinegar and spices. ● 1 cup pitted kalamata olives. ● 1 cup pine nuts. ● 1-2 cup fresh parsley. ● 1 teaspoon fresh rosemary. ● 1⁄4 cup olive oil. ● fresh ground black pepper. Add garlic to food processor, blend until minced. Add remaining ingredients except for olive oil. Blend until smooth, adding olive oil slowly while the blade is running. 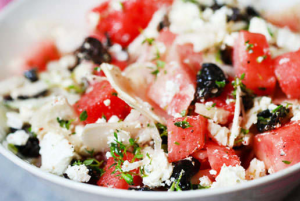 Adjust ingredients to your liking – Additional pine nuts, parsley or pitted canned black olives will make it less salty and intense in flavor, while additional oil will increase the creaminess. You can also use other fresh herbs such as sage or basil. Serve at room temperature. That could be a lot of tapenade or a little, depending on how much you want to end up with. As always, recipes are only recipes. Get creative! Change things up to suit your style, and don’t be afraid of messing it up. Eventually, you will find a combination of ingredients that are perfect for you and your tastes. The olive has enjoyed such a long-lasting relationship with us, and we keep coming up with new ways of incorporating it into our culinary lifestyles. Kalamata olives stand out in this regard, since they come from this one specific location, yet they have made a name for themselves all over the world. The potential is endless, especially when you consider a number of ways you can spice up your olives, literally.